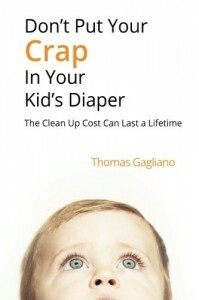 Don't Put Your Crap in Your Kid's Diaper takes years of the author's work improving his parenting skills discusses how to build better self-awareness; and it's recommended for all kinds of parents who would learn how to better interact with their children. The author's background lies in addiction and self-help therapy and thus he contrasts different parenting styles and their pros and cons, how to recognize and encourage healthy family intimacy, and how to understand the difference between rescuing children and supporting them. Many of the concepts from addiction therapy translate well to improving parenting skills, while specific paths (from journaling to support groups) are recommended to support a parent's efforts. The idea is to reduce or eliminate the damaging effect poor parenting skills can have upon children: Don't Put Your Crap in Your Kid's Diaper is clear and specific about these unintended results and how to mitigate them through a more conscious approach to parenting, and is recommended for all kinds of parents; from new parents to those who would analyze and revise their methodology.